We were thwarted by a "closed on Tuesday" sign on our last attempt, so today the MSG150 crew headed out again for Wing Wah Barbecue. We arrived to find a fairly typical meat-in-window joint with a big yellow sign and, of course, meat hanging in the window. We entered with carnivorous anticipation, except for Rob who just entered. We were greeted warmly upon entering the small restaurant and seated at a large table (the only large table) tucked between the kitchen and the meat chopping area up front. After reaching over and turning off* the poorly tuned clock radio, c. 1982, it was a pleasant spot. As we eyed the menu the waitress/meat-chopper suggested that we order family style so we could all get tastes. We chose a large selection of both meated and non-meated items. We spied two large bowls of leaf-wrapped sticky rice on the counter, so we threw in one of each for tastes. 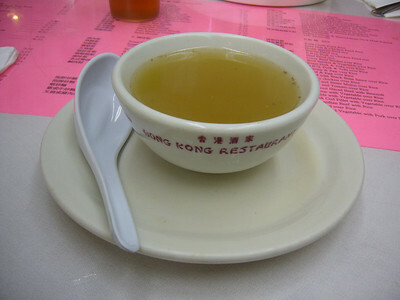 The starter was a hot pork broth in a bowl from the Hong Kong Restaurant. The broth was simple, but very rich. The food arrived soon after the soup. The BBQ duck was great (as it most always is) but the pork was a bit dry. I always prefer the duck anyway. The green beans were a bit limp, but flavorful. 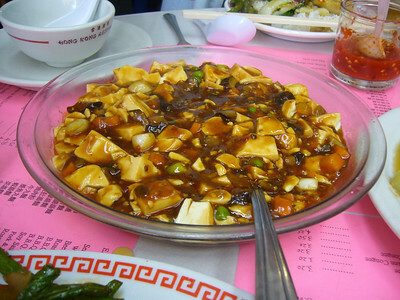 The Ma-Po tofu was fine, but nothing special. The fish was great. 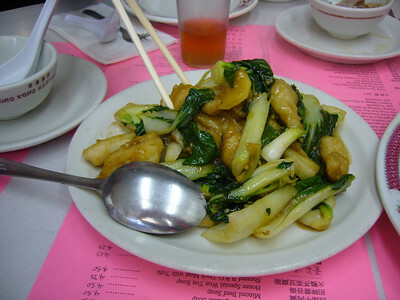 It had a nice tangy, garlicky sauce and fresh, crisp dark-leafed bok choy. 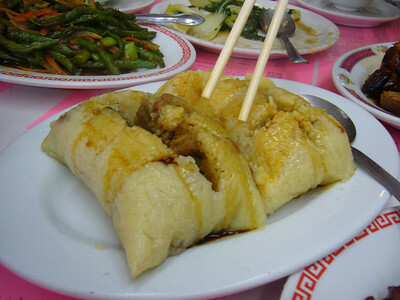 The two selections of sticky rice were described as one with peanuts and one with beans. I honestly couldn't tell the difference. They were both mushy and bland. However, it struck me how amazingly similar to tamales these were. 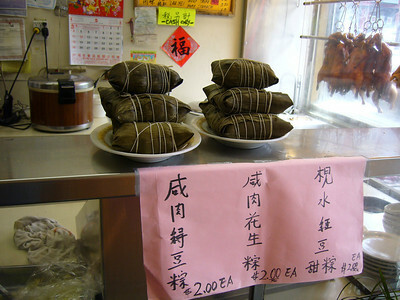 Both consist of a small amount of meat at the core surrounded by the predominant local starch (rice or corn) and then conveniently wrapped for portability. I suspect they evolved in their respective cultures in a similar manner. Anyhoo, these hadn't evolved** quite enough for our tastes and went mostly uneaten. Wing Wah is not one of the best spots we've been, but it has some gems and uses nice fresh ingredients. That plus the very friendly service gets four chopsticks from me. * I turned it back on before we left. ** It's likely, however, that we are the ones who hadn't done the evolving. 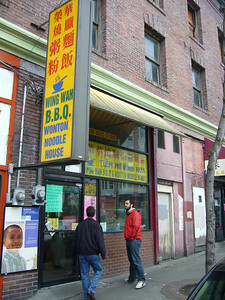 This little block has a pretty diverse set of food, as we found out by completing our fifth and final restaurant - Wing Wah. 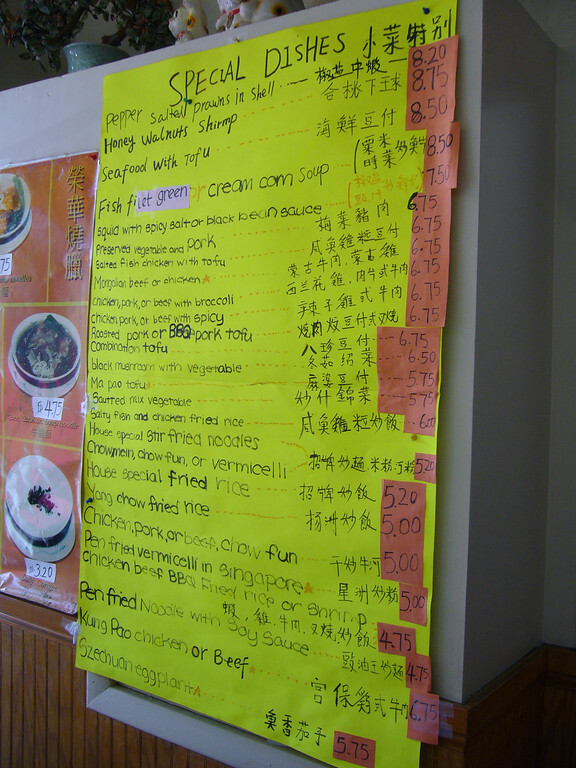 For starters, there's 663 - with high quality meats, good all-around food. Sandie's, probably closed now, serving authentic Taiwanese dishes. J Sushi, where you get your raw seafood fix. A & B, where you go if you just hate yourself. 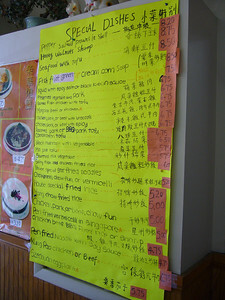 Now Wing Wah, which surprised with some good BBQ meats, comfortable relaxed atmosphere. This place seems frozen in time. The clock radio next to our table was the old style, where the numbers rotated on an axle. There was a TV from 1968 or something. The lady recommended we split some dishes and go family style. I'm always game for that. We got some pork, duck, seafood, some green beans, tofu for Rob, and sticky rice. The soup was good, the pork was kind of bland - not as good as Ocean City nor particularly fatty or fresh. 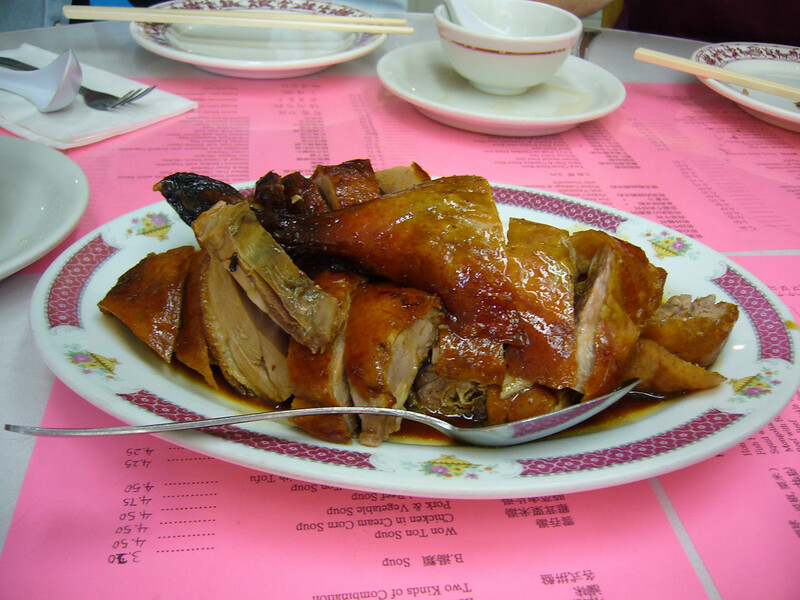 The duck was tasty, on par with other meat-in-window duck. The fish was kind of nice, deep fried with some bok choy. The rice was a little bit of a disappointment. As far as meats go, this place was good, but not quite on par with 663 across the street. Ahh... my favorite kind of restaurant, meat in window. Our server pushed us to do an ad-hoc family style lunch... and we obliged. We've got several Roast Duck lovers on this excursion... so we order half of a duck. Delicious as always. We ordered BBQ pork. Delicious as always, and wasn't too salty. 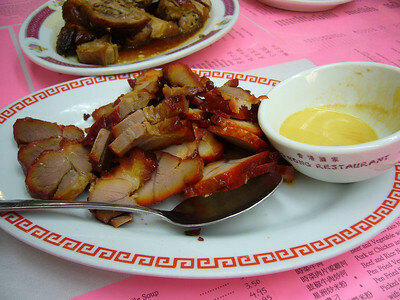 They also served the BBQ pork with some spicy mustard. The fish fillet with vegetables was good. Basically everything we had was good. Unfortunately we had the Vegetarian Rob, so we had to have more non-meat than I would have liked. We lived, though. A solid Chinese BBQ joint with good service. Decisions, decisions. Wing Wah had its pluses and minuses. Friendly service, and they were very accommodating for fussy eaters like me. 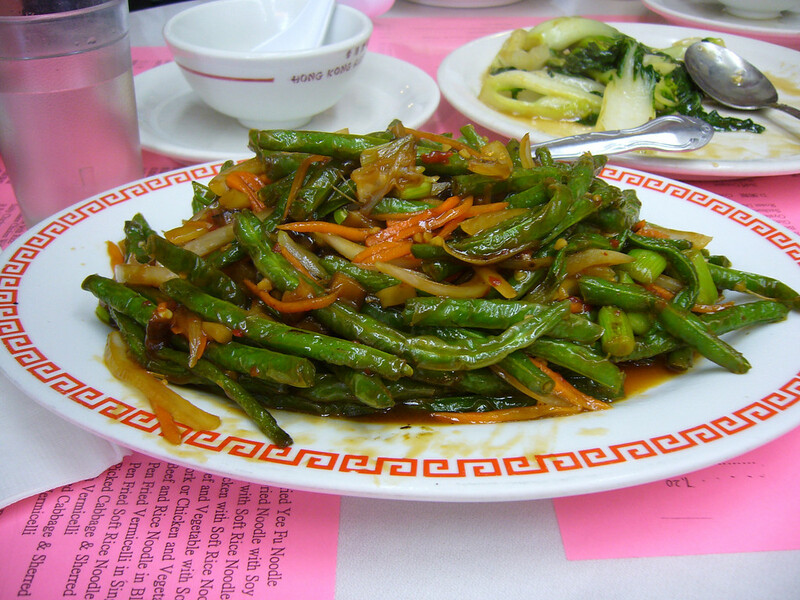 The string bean dish was quite good, and I usually don't like string beans. The Ma-Po Tofu was middling to average. The Fish Fillet with Vegetable was mixed: the fish itself (saba) was very good, but I'm getting pretty tired of the "[blank] with vegetable" dish that comes out with the singular vegetable being bok choy. So, I'd like to rate Wing Wah a 3.5, but I can't because that would make Adam whine more than usual. If we'd eaten here after A & B I would probably round up to a 4, but after Sandie's I think I'm going to round down. So it goes. This may or may not be my last post for the original DLZ -- I'm going on vacation for a bit. It's too bad that I'll be missing Hing Loon and Tropics and Shanghai Garden (I'd probably give them all 4 chopsticks), but not quite bad enough for me to cancel my trip. If my fellow lunchers lunch slowly enough, I may be back in time for the last stop, Fort St. George, for better or for worse. At least they have a full bar. I just moved to Seattle last week and a couple of people independently recommended I check out your blog. I am really enjoying it so far. However, I wanted to make a comment about Rule #2. (I'm not done reading all your posts yet - I'm only in March - so maybe you've addressed this in the meantime. If so, I apologize.) I am Chinese and I strongly feel that at a lot of the more authentic Chinese restaurants, the lunch specials menu is code for "safe for white people." I grew up on the Eastside (though it's been more than a decade since I've lived here) so I've been to quite a few of the restaurants in the ID , and in some cases I've read what your group has ordered off the lunch specials menu and thought to myself 1) nooooooo, and 2) I've never known any of the chinese families we know actually order those items when we go to those restaurants. So, is it possible to amend that rule? I hear you. New Star is a great example. I have seen very positive reviews online for their dinner entrees, but their lunch specials clearly were aimed at the local business folks, not their Chinese clientele. Our goal, however, is to review the lunch scene at these spots and that means eating the lunch menu. Right next door to New Star is Golden City which has a lunch specials menu that includes lots of non-Americanized options. My suggestion to places like New Star is this: If you make great food, offer it to everyone. You are only hurting yourself by only offering me crappy egg rolls and red syrupy meats.
" Unfortunately we had the Vegetarian Rob, so we had to have more non-meat than I would have liked. We lived, though." Having a vegetarian in your group is like looking for food with a cow. If you don't find enough, you can eat him.